Adobe is rounding out its Creative Cloud suite with a new website design tool. 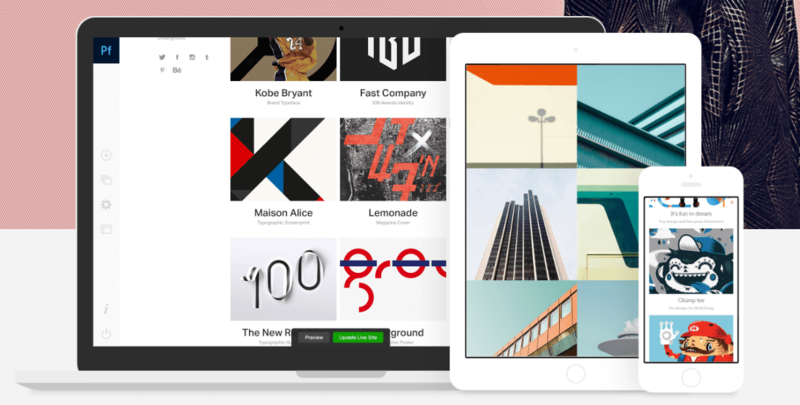 Dubbed Portfolio, Adobe’s offering takes dead aim at Squarespace, Wix and others by letting anyone create a stylish website in minutes. Portfolio is aimed at being just that: a digital display of design work. Adobe says it’s about “giving creatives a new advantage for showcasing their work,” and seems to lean heavily on visual assets rather than text. In addition to the slick interface, Portfolio offers you a personalized URL, analytics tracking, Typekit fonts and password-protected pages for those projects you’d like to keep under wraps. Those already using the Adobe-owned portfolio sharing tool Behance will have their Portfolio pages synced. Adobe also has canned layouts you can use to get up and running quickly, but Portfolio sites can also be built from scratch. For those heavily invested in Adobe’s suite of products, it’s a nice add-on. If you’re not getting what you need or want with another website building tool, Portfolio may be just what you’re looking for.